"By The Bay" is an ADULTS ONLY establishment & we cannot allow any kind of pets. We offer a great value & a most unique & therapeutic, ever changing Ocean View.. Besides crashing on the rocks, the waves often come from three different directions & explode together, towering 50 feet. The Local Charter Boats come into our view to watch the Whales. We even have our very own Water Geiser. Looks just like a Whale spouting. We also have a Marine Garden View during low tides. We are centrally located and within easy walking distance to all of Depoe Bay. Our rentals are 60' above The Ocean & only 100 yds. from the spectacular rocky shoreline. The rate is for up to 4 adults. We have a one bedroom 600 sq ft. Apt. located in the same building, with the same view available. Check out vrbo.com/98623. This is not a party house. We have older Guests who expect a quiet peaceful vacation. We are located just across Hwy 101 from the very popular 'Tidal Raves' Ocean Front restaurant & a city park. "Tidal Raves" opens at 11:00 AM each morning and closes during the month of January each year. We have 'Wing Wa' Chinese restaurant and lounge next door, to the North. There are private homes & the 1/4 mile long, Giant Sea Wall to the South. Enjoy Whale watching, either from Your vacation home, or with any one of the many fine charter boats docked in the World's smallest natural, navigable harbor. 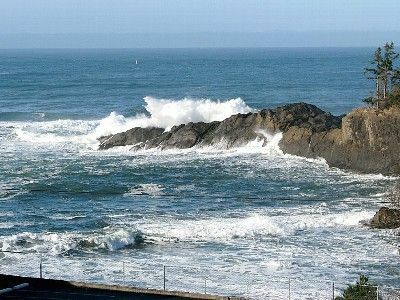 Depoe Bay is located in an, Ocean Front, deep water, rocky coastline area. Watching the amazing, ever changing wave action can be exciting and also very therapeutic. There are miles of sandy beaches within 2 miles, both north & south. Rate is for 4 Adults. $20 extra for each added person per night. Best suited for ADULTS ONLY.. No Smoking & No Pets. AT LEAST A THREE NIGHT STAY IS REQUIRED (a shorter stay, only if a fill-in is available). A cleaning fee of $50 for a 2 day stay. gas grill on wind protected, South side of building. 6' fenced, 100x67' secure, compound with covered parking on East side of home. Two Tribal Casinos, nature trails, aquariums, museums, Live theaters and movie theaters, fresh water lake and reservoirs, 4 golf courses, national outlet mall, Fred Meyer, Wal-Mart, Bi-Mart, many fine restaurants, shopping centers & other attractions everywhere. Newports' scenic Bay, Bridge & historic waterfront, 'Oregon Coast Aquarium', OSUs 'Hatfield Marine Science Center' miles of wonderful public sandy beaches. Depoe Bay is 2 hours from Portland PDX and 1 hour from The state capital of Salem. *Shorter stays require $50 cleaning fee. Vicki & I have lived here on the Central Oregon coast all of our lives. Vicki has three children, 6 Grand Children & 5 Great Grandchildren. I recently retired with 20 years in Real Estate to enjoy our Vacation Rental business. We fell in love with the unique ocean view from this City center location. The ever changing wave action on the rocky formation jutting out into the Ocean creates therapeutic & spectacular wave action year round entertainment. We have a US Coast Guard Station, right here in our little fishing village, located right on the deep Ocean. We enjoy one of the most unique ocean views anywhere on the coast. toilet, combination tub/shower, Double Sink Raised toilet. Double sink. Double Mirror, Bath/shower, Raised toilet. 12 bath towels. Fishing village with worlds smallest navable Harbor. Only 100 Yds. to the rocky shoreline! 100 Yds. to the Ocean from rental. 100 Yds. to the rocky shoreline. Spectacular, & unique Ocean view. On warm days you can close the westerly blinds & open the North & South windows to let the natural 'Trade Winds' cool the home while you are out on your coastal adventures. Fast Cable WiFi. Bring your laptops! With full Ocean View, 46 inch TV, Large gas fireplace, seating for 12. Many live plants. Brand new carpet. Everything you need. Coffee, tea, creamer, sugar. Some condiments and seasonings. Kitchen/Dining area is Ocean View,. Dish Satellite TV. 46" Samsung TV. in Family Room. 46" Samsung TV in Master Bedroom, next to bathroom. Movies in all bedrooms. Library of books and magazines. Lots of board games & puzzles. Large library of DVD movies, plus HD movies. 3rd bdrm nintendo. Games also available on Internet. Commercial charters in the Harbor. Ocean View, 16'x8' Wood Deck with raised Bistro tables & chairs, located on the South (Sunny) side of building to avoid the wind during the Summer. diving surf shops in Newport & Lincoln City. Brand new Carpet in living room. We have added a 6' privacy fence, an 8x16' ocean view deck on the southern, wind protected side of the building with a Weber gas grill. There are 2 Big Screen LCD TVs. All with HD DVD players. Dell PC, with 22 inch LCD monitor. The main Bedroom has been upgraded to a King size Memory Foam mattress & a 46 inch LCD TV. The 2nd & 3rd (loft) bedroom now have DVD movie players. and Queen Beds. Watch the spectacular ocean view winter storms from your cozy, warm, home away from home.